Merchant, planter, and colonial official. Built this house, 1770-1771. His "Hermitage" estate was eight miles north. 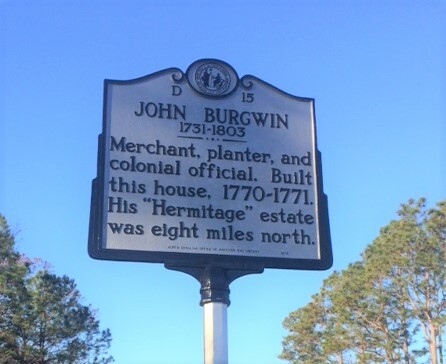 John Burgwin (1731-1803), progenitor of one of the most prominent families in North Carolina history, came to Wilmington from his native England by way of Charleston. Never a leading political figure, Burgwin held a number of minor positions, among them clerk of the Bladen court, clerk of the governor’s council (1760-72), clerk of superior court, clerk of high court of chancery, Wilmington town commissioner, and Bladen legislator. In the period 1764 to 1775 Burgwin, in league with partners such as Hugh Waddell and Charles Jewkes, profited handsomely from his mercantile operations and invested heavily in real estate. Burgwin also benefitted financially from his marriage in 1753 to Margaret Haynes. According to historian Donald R. Lennon, Burgwin “attempted to tread the narrow path between Whig and Tory” in the 1770s. During much of the Revolution he was in England but he returned to North Carolina and regained his estates. Two of the finest houses ever constructed in North Carolina were homes of John Burgwin. The Burgwin-Wright House was built in 1771 on the site of a former jail in Wilmington. Since 1937 the house has been the headquarters of the Colonial Dames. In addition to its fine workmanship, the house derived notoriety from its association with Lord Cornwallis, who is said to have used it as his headquarters. As Burgwin shifted his principal business interests from mercantilism to planting, he spent more time at “The Hermitage,” his plantation on Prince George Creek. Originally a modest house built by Richard Marsden, “The Hermitage” was considerably enlarged by Burgwin, who also added a final English landscape garden. It was destroyed by fire in 1881. Burgwyn descendants (the spelling changed in the mid-nineteenth century) have played important roles in the state’s history, particularly in military service. Notable members of the family include John Burgwin’s grandson John Henry King Burgwin, hero of the Mexican War; great-grandson Henry King Burgwyn, the “Boy Colonel” killed at Gettysburg; great-grandson W. H. S. Burgwyn, banker; and granddaughter Eliza Clitherall, diarist.